Today felt like a classic and sophisticated feminine shoe day and this refined style boasts all the elements of a stunning classic - Breton stripe, chic slingback silhouette, and a quintessential summer color. 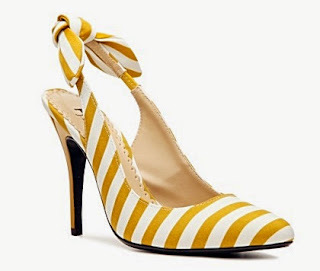 I love the J. Renee Bazuka Pump for its elegant summer striped fabric upper, the non-adjustable slingback strap with stretch panel, pointed toe, 4" patent leather covered heel, and its wonderfully affordable price of $59.95 at www.dsw.com. If you're not into the sunny hue of this style, it's also available in a chic black/white and a smart nautical blue/white.